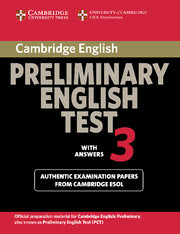 The Cambridge Preliminary English Test 3 practice tests provide candidates with an excellent opportunity to familiarise themselves with the 2004 PET exam and to practise examination techniques. The Student's Book contains practice material for Paper 1 (Reading and Writing) and Paper 2 (Listening), along with attractive colour visual material for Paper 3 (Speaking), enabling students to prepare thoroughly for the paired Speaking test. The 'with answers' edition contains a comprehensive section of keys and tapescripts. The Audio CD Set (available separately) contains the listening material for Paper 2 in the same timed format as the exam itself. 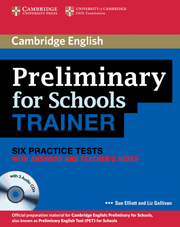  Contains four complete papers from University of Cambridge ESOL Examinations, adapted for the updated examination (from March 2004).  Familiarises students thoroughly with the content and format of the updated PET examination.  Includes a comprehensive section of keys and tapescripts making it ideal for self-study use.